Winnie the Pooh is one of my favorite philosophers. He knows so much. I especially love that he is so humble in his wisdom. Every time I read this quote I remember that it’s my responsibility to “get in there and play the game.” To get out of my corner of the forest and connect with others, or jump into the fray. So often we wait for others to come to us, or wonder why we’re not part of a conversation or a decision. Pooh reminds us that the onus is on us to be part of what’s going on. It can be easy to sit back and wait. It can be easy to blame others who don’t reach out to us. It can be easy to say we would have gone after our dream if the opportunity presented itself. It’s not easy to be like Pooh and realize that sometimes we have to be the one to make the effort. 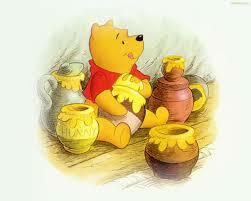 Pooh also offers another important aspect of this approach – self-care. Remember that Pooh loved his elevenses – his snack of honey at 11 o’clock in the morning (and lucky for him I believe his clock was often stuck at 11 o’clock). No matter how often or how far he ventured from his corner of the forest, he usually made sure he was home at 11 to replenish. Stepping into the fray takes energy. Energy to reach out to others when the last thing we want to do is talk with them to resolve a disagreement. Energy to build up our confidence to go after what we want. And we need our own elevenses – whatever that is for us – to fortify and renew us. Pooh’s advice reminds us that if you want to accomplish something, you must remember that it’s your responsibility to make an effort and get out of your comfort zone – your comfortable corner of the forest. If your goal is to resolve differences or to connect at a deeper, more effective level with others, it’s your responsibility to be the first to connect. And as a leader, it’s your responsibility to model this behavior so that your team (or family, or organization, or self) can step away from what they know, make a first attempt to connect with others, and not stay waiting in their corner of the Forest. How can you leave your corner of the Forest? For support in stepping into the forest, contact Lisa at lkohn@chatsworthconsulting.com.